Paul Scott (born 1953) is one of the most astute political commentators studio ceramics has produced. 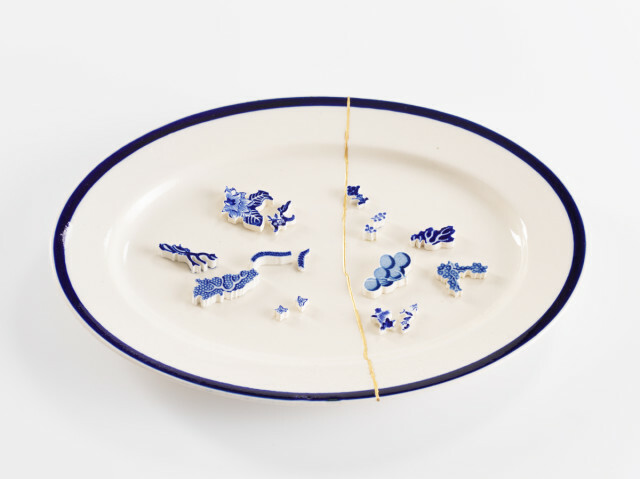 His playful interventions, particularly those of his blue and white china pieces, thoughtfully and provocatively chart and investigate (as he puts it) “the cultural wallpaper in our minds”, subtley subverting the domestic familiarity of familiar patterns and images to make us think about the complexities of history and contemporary society through transfer ware and collaging. He has combined the traditional familiarity typical of blue and white pastoral scenes with unexpected and incongruous vignettes of environmental and political incursion and other subjects. Mass-produced printed images such as those used by the pottery industry offer consolation and reassurance, but Scott uses his subversion of such work to hit home the thorny issues that affect us now. Scott, who studied at St Martin’s College, Lancaster in the 1970s, lives and works in Cumbria.